Seevers, Boyd. 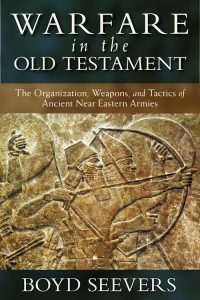 Warfare in the Old Testament: The Organization, Weapons, and Tactics of Ancient Near Eastern Armies. Grand Rapids, MI: Kregel Publications, 2013. Warfare in the Old Testament by Boyd Seevers documents the reality of warfare in the history of the six most prominent nations of the Old Testament, specifically: Israel, Egypt, Philistia, Assyria, Babylon and Persia. Each nation is examined through the events, duties, weapons, and battles from a historical background of known conflicts. The discussion of military organization, weapons, strategy and tactics allow Seevers to guide the reader by providing details of these armies through stories, historical information, military artifacts, drawings, sketches and maps. Through the eyes of a civilian, Seevers tells the story of a native Israeli who comments in an interview, “I can’t imagine life without the army” (p. 19). Warfare affected the lives of the people. The idea of people desiring, “that we may be like all nations, and that our king my judge us and go out before us and fight our battles” (1 Samuel 8:20) is brought into context, “in the spring of the year, the time when kings go out to battle” (2 Samuel 11:1). Seevers’ writing engages the reader to consider the details of Israel’s war involvement and the sovereignty of God is emphasized in His aid to the nation merging the biblical narrative with application of the history of war. Biblical and extra-biblical accounts are woven together providing a picture to the reader. Scripture references allow one to refer to the specifics for themselves. For example, in Joshua, the details of the entrance into Canaan and the battle of Jericho are magnified as the significance of physical protection by the Lord during the time of healing from circumcision. This biblical story is paralleled with a modern soldier’s story from Seevers’ life experience. Israel’s five major enemies, although there were other nations, are highlighted in the different eras of their history. Egypt was a large empire to the West where the Israelites escaped by the hand of God through Moses. However, they continued to exert influence throughout the region. The Seafaring Philistines troubled Israel during the period of the Judges and early monarchy. The Assyrian’s cruelty destroyed the northern Kingdom of Israel while turning Judah into a vassal state and laid siege upon Jerusalem. Babylon’s attack on Judah carried its people into exile also with the spoils of war. The Medes and Persians later overthrew the Babylonian empire. Seevers illustrates the unique features of each culture by describing battles from the perspective of one of its military commanders along with organization, weapons and tactics. Old Testament scholars seek to avoid relegating Scripture to secondary status. As theologians, one seeks to understand the hermeneutical construction of the biblical texts claiming that God is the first source initiator and sustainer of events. War in the Old Testament does not have a simple solution. Seevers provides an excellent basis for focusing on Scripture and allowing it to enlighten one’s theology. God’s ideal judgment of Israel’s enemies is left to Yahweh as a warrior. Israel fights with Yahweh under the rule of the judges and Saul; again under David; while Yahweh fights against Israel’s disobedience by sending the nation into exile. Security against external threats is grounded in the warrior of Yahweh and not the armies of the people. One cannot understand the Old Testament without reference to war. Bethel, an important city to ancient Israel, was destroyed four times in the two-hundred year period from the time of the Judges to the establishment of the Davidic monarchy. The differences between Israel and their enemies point to different value systems. The focus of obedience to Yahweh is reflected in that the Israelites did not glorify warfare as did their neighbors. Israel did not engage in hero worship or erecting monuments commemorating battles as did the Assyrians. Such focus is found in Isaiah, who prophesied during military crises by exhorting the nation to trust in God alone to meet these military needs (Isaiah 19:1-3; 30:15-18; 31:1-5). God alone has the right to destroy and kill. For example, in Joshua 5:13-15, Joshua asks the army commander of the Lord whether he is for us, or for our adversary? Neither! The Lord is for those who follow His command. The book provides an excellent background and context for the biblical text. Seevers’ synthesis and summary of Ancient Near East provides a resources for pastors working to exegete a text, even though Seevers writes expositionally. 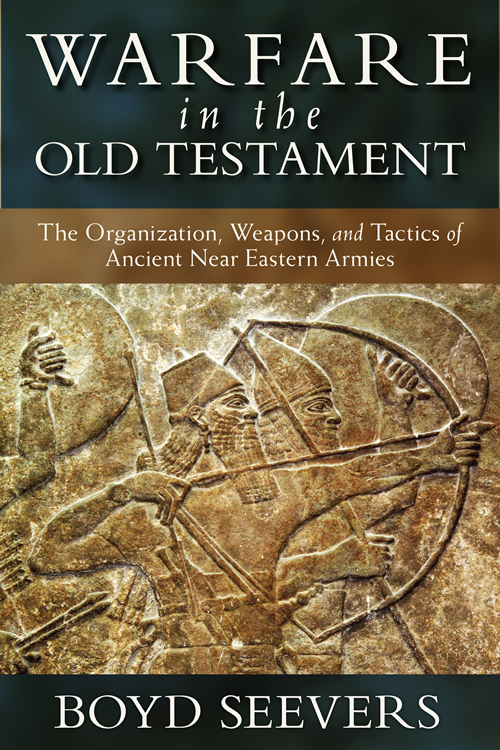 The book may also be an opportunity for a Bible study, military Chaplin, or anyone seeking to view the Old Testament through a lens that is not often considered as it spans the whole of Israel’s national, military history and how weaponry, armor and military structure changed over the centuries as the Lord led. Get emails in your inbox whenever we update!